What is a bone survey? The results of a bone survey can be hard to interpret and the provider looking at the results should know the patient’s medical history. Past bone injuries can be seen on a bone survey. Bone surveys are used in patients with multiple myeloma for both diagnosis and to see how far the disease has progressed. Multiple myeloma causes bone to break down and there can be lesions which look like holes in the bones on x-rays. How do I prepare for a bone survey? You do not need to do anything to prepare for a bone survey. You will lie still for a few minutes while the x-rays are being taken. During the exam, the radiology technician must leave the room to avoid radiation exposure. They will be nearby, in an area where they can see and hear you. The amount of radiation a patient gets is small, but if you are pregnant you should let your provider know. How do you receive the results of your bone survey? The radiologist writes a report for the provider who ordered the bone survey. The report provides information about the patient, the reason for the test, if contrast was given and what was found. The report will detail both normal and abnormal findings. Your provider will be able to discuss your results with you. 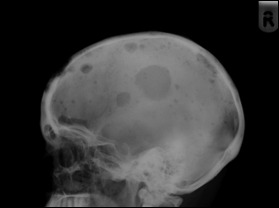 Skull image from a skeletal survey in a patient with myeloma. Note the "lytic lesions" that look like holes in the bone. March is Multiple Myeloma Action Month!